My summer garden looks amazing! Everything is lush and thriving, in spite of challenging conditions common to the hot humid south. While I’ve come to expect that, experience has taught me to roll with the punches quite well. Yet I still know it’s not always in my control. But I do feel like some strategic steps I’m taking are packing a powerful force in my favor—especially this latest habit. For the past several months, I’ve been feeding my plants a liquid diet of “worm leachate”. That’s the fancy word for the liquid that flows through a bin full of worms as they happily devour food scraps, paper, cardboard, coffee grounds, etc. Since spring, I’ve been collecting this liquid worm juice in pans placed in the bottom compartment of my bin. I specifically designed it to capture every drop of this liquid gold. From past experience, this is a magic elixir that offers incredible results for my plants and soil. I first discovered its astonishing healing properties many years ago when I started my first worm bin. The liquid had accumulated in the bottom compartment, which included a spigot. That was my first clue to consider tapping into it. That, and the super rich, coffee-colored liquid looked too good to waste. In fact, it looked so rich, I diluted it with 10 parts water and it still looked just as potent. If compost tea was good, this had to be great I thought. I gave it a try on some ailing potted azaleas by pouring it around the roots. Much to my surprise the very next day my sickly plants showed significant signs of improvement. That was the moment that I became a super fan of this amazing, organic liquid fertilizer. Now that I’m back to raising worms for vermicompost (worm manure) and especially the juice, there’s no turning back. I feed my plants about every two weeks with a 10-1 or even 20-1 dilution of the leachate. That’s it. While I always focus on building healthy soil by adding compost twice a year, since spring this is the only other thing I’m doing. I could not be happier with the results. Even with hot, humid days and extended periods of rain (a tomato plant’s worst enemy) I must say, I’m staying ahead of the disease curve. Full disclosure, I do spend time almost daily, proactively inspecting my plants and removing any signs of developing problems. But equally important is that my plants are getting what they need from great soil combined with the worm juice to stay healthy and stave off potential disease disasters. That alone is making a huge difference. The geek in me had this liquid gold analyzed by the University of Georgia. I wanted to see just what was in it that made it perform so well. While the results showed the presence of all the important nutrients and a healthy dose of minerals (something you don’t get in synthetic liquid fertilizer), I believe the real secret lies in the natural design of the perfect liquid organic fertilizer, replete with everything (including billions of good micro-organisms) that plants and soil need to come to life. 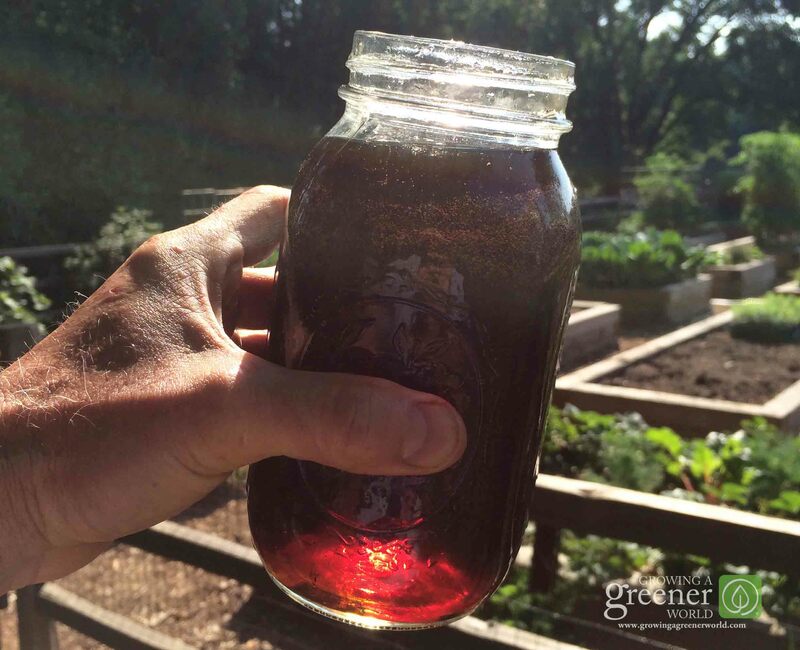 My fellow garden geek and horticulture professor Jeff Gillman, Ph.D, also sent me his take on using liquid worm leachate in the garden. As expected, his summation is certainly more academic than mine, but favorable nonetheless. It’s always nice to have neutral take. But what I can offer that you can’t get from a lab is this—the proof is in the results, and that I can say without hesitation, is nothing short of amazing! Like this post? Don't miss out! Hi Joe, I have just been given worm juice for my tomatoes (I live in southern Australia. Our summers can get very hot up to 40 degrees celsius) My question is how often do I fertilize and do I wet the leaves as well as the soil. I have just given my seedlings a drink yesterday and they are looking really healthy. I am concerned that the leaves will burn in the heat. Hi Dawn. That should not be an issue but to be safe, apply the worm effluent directly to the soil. No need to wet the foliage. But if you do, do that in the evening if you’re concerned about the sun. Great post and please keep posting a helpful article like this! Thank you, cheers! This post needs to be broadcasted to the gardening world as there is so much contradictory information about Leachate. While the intertubes was telling me it’s “bad”, I was getting great results, and I really appreciate you providing objective data and scientific authority behind what we’re seeing in our garden. Glad the information was useful for you, it’s good to have all the facts. Have a great season in the garden. I too can attest to the use of worm tea , leachate and worm compost tea that we notice increase amount of our garden yield . I know from all stand point it seems very questionable that this method should work or have biological explanation for this process and or the benefit of thinking this could benefit anyone`s garden . But lets look at this process to see if we can bring a little understanding . 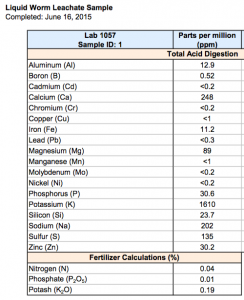 All soils potential and the decomposition of organic materials that the worms have terraform into the soils structure . Now brewing this into a container with black molasses ( or organic medium ) with air going into the brew of water , molasses for 24 to 48 hours you have the perfect fertilizing solution for a successful garden . 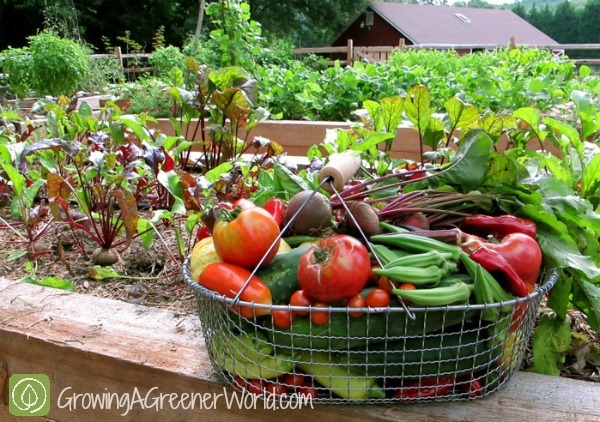 Now my wife and are have had many successful gardens thru the years except for this year it has been frustrating and still rewarding to discover any knowledge that will give us encouragement to continue growing our garden and sharing the harvest with others . Hi there! I happened across your site and WOW I’m so glad I did! I’m new to composting in general and now I’m even more excited to try it with worms!! I have a compost bin that is probably more than half way through. Is it to late to buy some and out them in? Also, should the bin only get veggies, fruits, grass etc., paper? Or maybe you have a link with what’s safe to add to your compost? Thanks!! We have a worm farm (commercial type) and we use the liquid diluted 10% with water and are really pleased with the results. It is sprayed on both leaves and poured around the plants. I enjoy your comments on the questions that are raised, and would look forward to your Newsletters. Thanks for your positive feedback Brian. If you like the newsletters, you may want to check out the podcast too. I have a indoor worm bin (two plastic bins) that doesn’t go outside. Today I collected my worm tea in a bucket and set it outside then filled the bucket the rest of the way with water. Not ten minutes later I looked at the bucket and they were little tiny bugs, kind of looked like very small mosquitoes. These bugs rose up in the liquid like a mosquito but clustered together on the top. The bottom of my stacked bin doesn’t get any sunlight so not sure what I had. Not sure either Sandra but not surprised. Lots of tiny flying bugs hang out around worm compost. I’ve never given it much thought and just assume it’s part of the process since it’s really so common to me. Suffice it to say it’s never been an issue for me. HI Joe, I have a question about my worm juice it is running high in PH about (7 to 7.2) do you PH your water about 6 before you add your worm juice? Hey Kelly. 7.0 is perfectly neutral. I would not sweat this for a second. You’re as close as you can be. I don’t test mine at all, assuming it’s close to neutral. And keep in mind, this is a small part of the sum. So relative to the total, it’s even less of an issue. 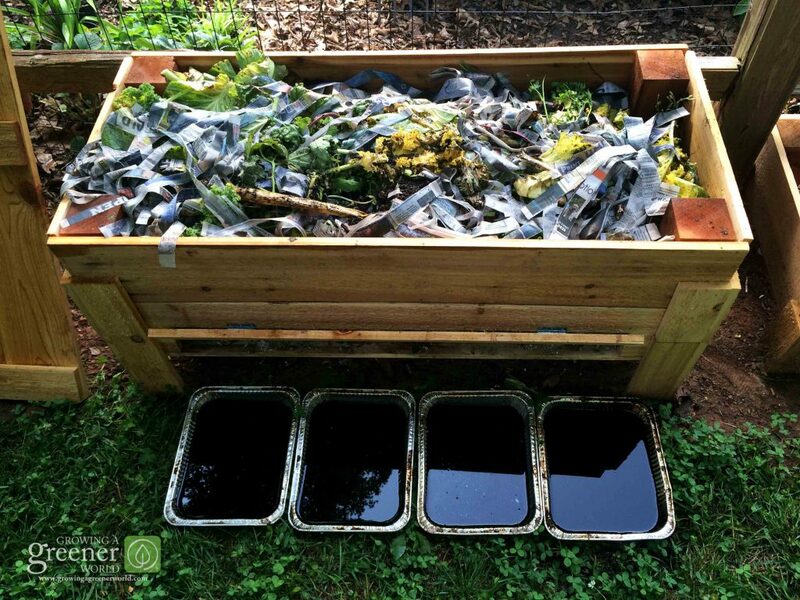 have you tried composting using the Bokashi method? PS…I too am a loyal fan of the show. Hi Lugene. Thanks for being a loyal fan! I have yet to try the Bokaski method but you are not the fist to mention this. I need to give this a try and plan on doing so very soon. Thanks for the reminder! Is it true that spraying diluted worm juice on plants leaves – specially on citrus family – keep the insects that destroy the citrus away? I remember hearing at a workshop that insects are not comfortable with the smell of the worm juice and do not approach the leaves sprayed with worm juice. I have been treating my citrus plants with worm juice, but the attack is still there. Please enlighten me. Harry, I don’t know of any studies that support these findings, nor have I ever heard of this. Personally, I doubt worm effluent is a deterrent in any way. Hence the reason you are still having issues. Too bad as that would be yet one more reason in support of using it (not that we need it). I have a wormery in my front garden. However for years I have added earthworms which I stumble across in the garden. Is this ok? They still produce an amazing dark coffee like liquid which I use diluted on all of my plants. Now I have thousands of worms which much away at all the veg, tea bags, coffee grounds in no time at all. I give bottles of the stuff away to friends and neighbours . When the bin gets full I use the compost around the beds. Difficult now picking out the worms there are that many. I would recommend this to anyone. Nature at its utmost best…..
Joe, I just found your site and show. Everything looks very informative. Regarding your worm tea…how do you get that much liquid? I haven’t done any vermicomposting but the folks that I have asked say they get very little liquid. Jim, it’s important to make sure the worms have a moist bed. So I lightly spray the bedding with water periodically. That, combined with the moisture content in the food scraps and the decomposition, the moisture is sufficient to generate excess to use for the garden, diluted 10 or 20 times. Hae Joe I appreciate the show and my plea is if u could partner with one TV station in Africa atlist for vermiculture to be rolled out it could help so much solve some social problems. From Kenya. Hi Billy. I would love that. We’re constantly working on spreading our reach around the world. Hopefully we’ll be in Africa sooner than later! Thanks for you note! Aha..finally… im also doing the same principle.. but without the worm.. i did include Neem, papaya and a few other plants… i do agree with you with the amazing result. I really appreciate if i can learn how to store it properly and for how long it will last.. thanks so much i feel very happy to read your columns. I don’t know the answer to how long the diluted work effluent keeps. Or if it becomes unsuitable for use after a period of time, especially in a sealed container. I suppose some University lab testing could assist with this question. And it’s a very good one. I just have not had time to explore to this detail since I use my solution as soon as I have enough to apply to my plants. If you find out please let me know. Thanks. Hi Joe, I am planing on building a warm bin I was wondering you thoughts on using the warm juice here on fruit trees. I just planted them last fall and I live in Michigan would this juice help or hinder me in fruit tree growth? I would use it where ever you want to add organic nutrients to the roots. Surly your fruit trees would benefit from this. Go for it Jon. Hi Joe, I made my worm bin out of a plastic storage container. My problem is I had it outside and had a huge fruit fly and fungus gnat problem. I tried to get rid of them but I had them in the house when I brought it in the fall (I live in Indiana). How can I control that problem when I start it up again? Any suggestions on getting rid of fungus gnats in my house plants soil? Hi Christy. I agree those gnats are quite annoying to see in the worm bin. I don’t have a good solution for you unfortunately. Hopefully by posting this here, someone else can chime in an offer some good suggestions. Since my bins live outside all year, I’ve not be faced with having to deal with this problem. Buy a worm inn. Go to http://www.TheWormInn.com. It has a zippered top so no bugs can get in and it has great aeration. Another thing that works well is to keep a bug-impermeable layer on top such as wet newspaper, cardboard or carpet. The water will seep through it, but a solid sheet will prevent too many flying insects getting in to the worm farm. Me and my wife love the show. I love this website as well it has helped me tremendously as i prepare to start my own garden. I had a quick question. What are your feelings on storing rain water? Also what about mixing this worm juice with the rain water? Would it be even better than mixed with regular water? Me and my wife love the show and cant wait to buy our home and use a lot of the knowledge we have learned from your show on our own farm. My question is, when you mix the worm juice with water do you use just regular water or do you catch save rain water and mix that with the juice? Im just curious if rain water would be even more beneficial than water from the house or where ever? Hi Aaron. I think rainwater would be best! I have well water so it’s great too. But in this case, even tap water would be ok as I just want to make sure the nutrients get to the soil. So the water is just a way to dilute the pure concentrate and deliver it in a liquid form. Thanks for the kind words about the show too Aaron. ARE COFFEE GROUNDS GOOD FOR PLANTS OR IS THIS AN OLD WIVES TALE. Coffee grounds are a great soil amendment, very much like other components such as shredded leaves, composted manure, etc. I add all the coffee grounds I can get my hands on to my compost pile. The grounds just become part of the whole. But my plants respond very well to this amazing compost cocktail. Can you give me your plans for your worm bin that allows you to collect the worm juice? I would like to know if there is any site where it would show the construction of the worm bin you have displayed in your article? We have that and will be posting on our site in a matter of weeks. I’ll announce when we do or check back periodically. I’ll also go back through this thread and try and let you know when I do. I have had a simple worm bin for a couple years and it works to collect the juice. I bought two plastic storage bins. The heavier ones. I drilled 1/4 holes in the bottom of one of them. This one is my compost bin. The 2nd holds the juice. All you need is something to create separation between the two bins when stacked. When you are ready to harvest the juice just lift out the top bin. I also find that having a heavy layer of leaves and grass on top of the compost keeps down the flies. I read somewhere that they can’t dig through the top layer so that don’t get to the compost to feed. I try to keep 4 to 6 inches on top of my compost. It’s not 100% effective but it does help. Thank you Michael. That is a good link that raises some important issues. I considered this when writing and posting this article. While erring on the side of caution never hurts, I consulted with my guru on such issues, Dr. Jeff Gillman who has also done studies on worm leachate. His take is this and I concur; “Always better to be safe than sorry. As long as you don’t apply the leachate directly to anything you eat there’s no concern at all — might be a little difficult for the leafy veggies. I doubt that a human pathogen would prosper in these circumstances, but I can’t completely discount the possibility”. So yes, avoiding direct contact with the actual food you consume is a good practice. But pouring around the plant we don’t believe to be a risk with edibles. I do thank you for providing this information and I am happy to make it available to our readers. Hi Sharon. Red wigglers are the classic worm for vermicomposting. They’re readily available in some nurseries, and online. They’re even sold at Walmart for fishing bait! Buying a bag of compost would be a good addition to start your bin as an additional bedding source. I think that is a good choice and gives the worms a nice place to set up camp and get started. But, it’s not necessary. If you load the bin up with shredded newspaper or paper, food scraps and/or garden debris, and add enough water to get the bed well moist, the worms will go to work quickly. About the worm bin, can you provide me with simple plans and should I make a cover for it for when it rains? Do you use a specific type of worm? This sounds like a great idea. Plans are coming Stacey and we’ll release them soon in an upcoming newsletter or sooner if I can a chance. But it includes a cover, which I keep on all the time. Worms don’t like light and it keeps it dark, moist, and the predators out. google “Oregon Soil Corporation Reactor”. They have a great set of plans. do you have any plans you can share for making your own bin and how about in winter in cold climates (MT), does it have to be moved indoors? if so, what kind of issues does that present? Plans are coming soon Mia. As for winter, you could move indoors and will maybe help survival. Otherwise, worms in bins like this don’t survive winter outdoors. But, the eggs they lay will. They have a sort of “antifreeze” associated with them that allows them to safely overwinter. While the parents won’t survive, the eggs will hatch in spring. Great post and I’m wondering if this would solve a lot of my issues! Does it smell terrible? I would need to keep something like this (relatively) close to my house. A properly set up worm bin does not smell. In the winter I keep my worm bin in my utility room then put it outside when the night temperature does not go below 10 degrees C.
Love the photo with your worm bin..do you have plans you coul share? We have had a bin for several years, we live in NH and bring it in in the winters, but would love to make a permanent bin for summer months. Hi Cheri. Plans are coming. I should have them out in the next newsletter in about 2 weeks. hey Joe, I always wanted to do vermicomposting, but never got around to it. I do build my soil with compost and take care of it and discovered that worms just happen. Though it would be great to have that juice, my low maintenance plan is so easy. I did go through an almost identical discovery process as you with another substance. 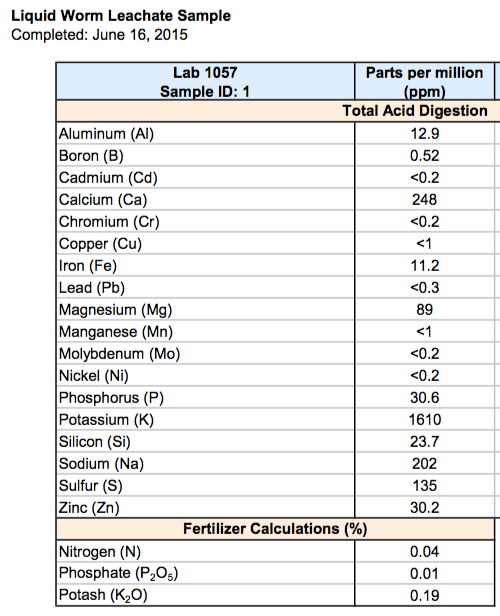 I didn’t send it to a lab, but I researched it on the internet and it too had great numbers, particularly as a fertilizer. I also dilute it, but a little less than 10:1, and I have had great results. I know you are a family show and are trying to make this all appealing to prudish Americans, so I will just say I make it myself several times a day and its golden. So I don’t even have to do anything extra to make it!